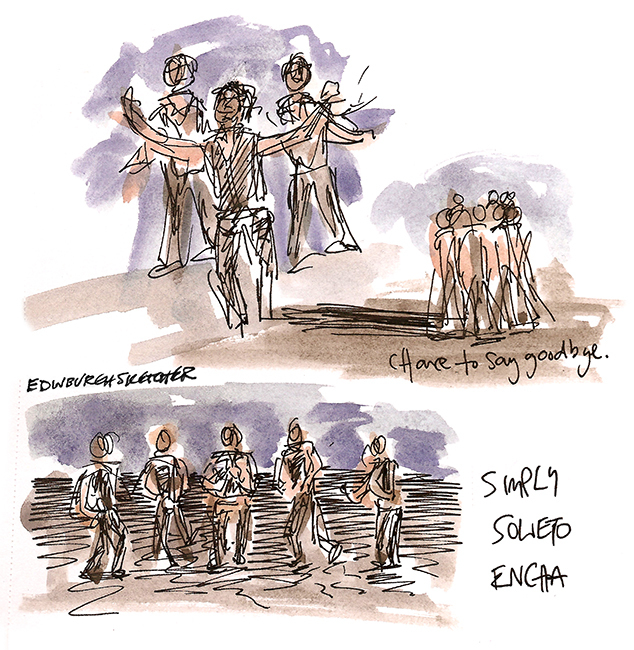 Yesterday while tweeting for Just Festival I sketched from a couple of shows. To help publicise my own exhibition, ‘Sketching The Shadows’, which can be seen within St John’s Church Chapel until the end of August, I was asked to take over the official Just Festival twitter feed for a day. The Just Festival strives to highlight the inequality and injustice around the world in the hope that we will then take into account how our actions affect each other and the planet as a whole, and the content can often be serious and thought provoking so I decided to keep my input light. Talking about what I was up to (delivering merchandise around Leith on my bicycle) and adding in a few sketches from some of the Just Festival exhibitions I managed to visit, both at St Johns Church on the corner of Princes Street and Lothian Road, and Central Hall just up the Lothian Road at Toll Cross. 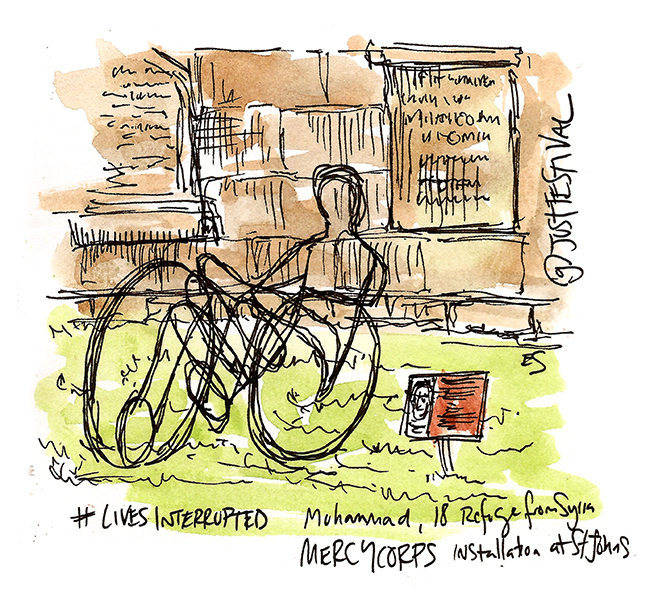 Above is a sketch from ‘Lives Interrupted’, a Mercy Corps commissioned installation of wire frame sculptures by Amy Pickles, in the grounds of St Johns Church yard. Representing the Syrian refugees the sculptures humanise the reports we hear daily and bring their plight much closer to us. Below is the front of Central Hall, where I visited later in the afternoon. Home to many of this years Just Festival performances the venue is very grand and worth a look around for the architecture alone. Inside Central Hall I was lucky enough to see Simply Soweto Encha, an a cappella group from South Africa whose infectious rhythm, energy and personality filled the hall and wowed the audience. I loved it and would recommend the show to anyone. The main image at the top of this post and the one below were scribbled down as I watched, clapped and laughed my way through the show. 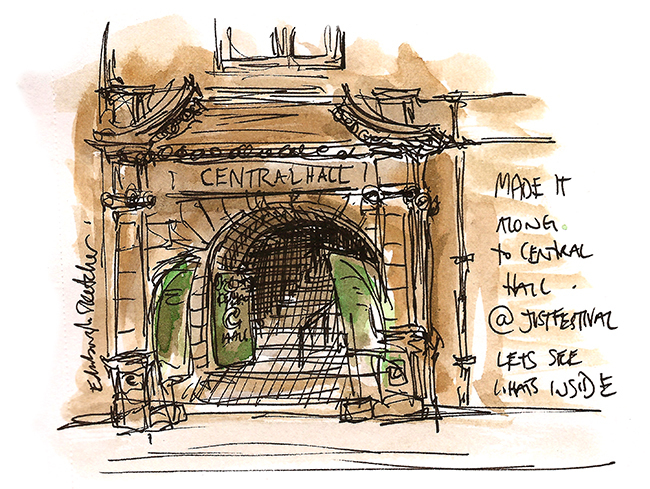 @edinsketcher we are glad you enjoyed your stay at Central Hall. You’re welcome back any time! 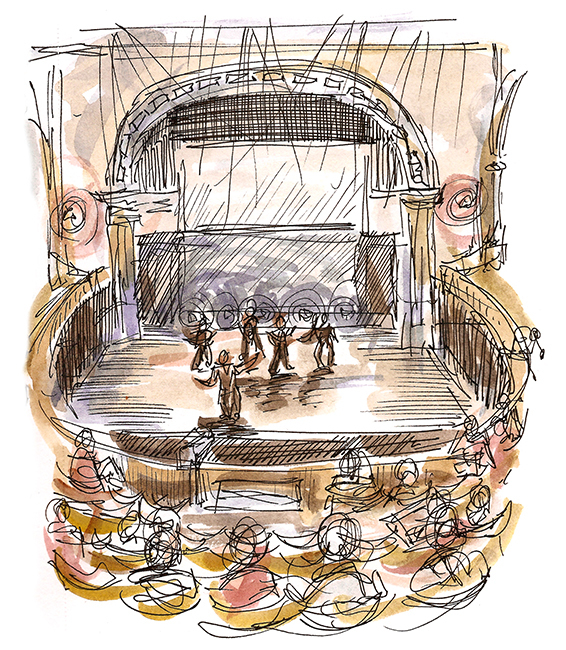 RT @edinsketcher: Yesterday while tweeting for Just Festival I sketched from a couple of shows….